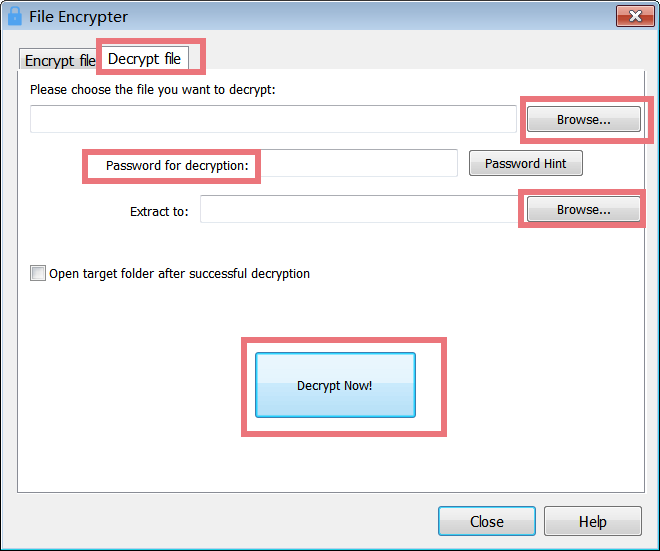 File Encrypter and Decrypter is a powerful professional encryption tool with an easy-to-use interface. It provides the safest way to store your information or sensitive data and protect them against malicious or unintended intrusions. 1. The First Line Buttons: quick access button to "Encrypt file" or "Decrypt file" function. 2. The Upper Box: allows you to add files that you want to encrypt and you can drag and drop files here. 3. The Lower Box: allows you to save a batch of encrypted files to defined folders, create password, password hint (in case you forget your password), and choose options whether you want to create a auto-decrypting EXE file, open target folder or delete the original file after successful encryption. The program encrypts files using the Blowfish algorithm, which is extremely secure if you use a good password (longer passwords are more secure). Any type of file can be encrypted, including pictures, PDF files, text files, Word documents or executable applications. This module also allows for the creation of self extracting encrypted files, then you need not have a copy of Glary Utilities installed to decrypt the files. File Encrypter is a specially-designed utility used to encrypt files to protect them from unwanted access. File Encrypter supports batch encrypt files. If you have lots of files need to encrypt, batch encrypt files can help to save much time. To batch encrypt files, you do not need to individually encrypt each item in the folder. All you need to do is to find the files you want to encrypt, click"Add File(s)" or drag and drop files in the blank field. 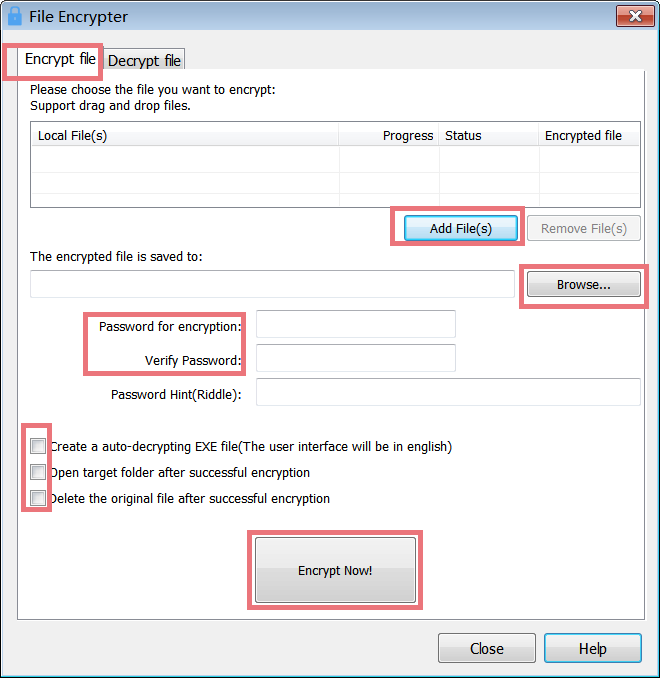 To easily find the batch of encrypted files and minimize the data loss, File Encrypter provides users with the function to save encrypted files according to the user defined location. Once you have created encrypted files, you can save the encrypted files to any folder you like. Therefore, you can easily find the files where you saved. First select the files you want to encrypt by using the Add File(s) button or just drag and drop files in the blank field. Select the destination folder where you want to place the encrypted file by using the Browse... button. Now you have to choose a password. The password must be between 6 and 16 characters long. Note: The password is case case-sensitive. There is NO way to decrypt the file without the password, so please make a note of it in a safe place! 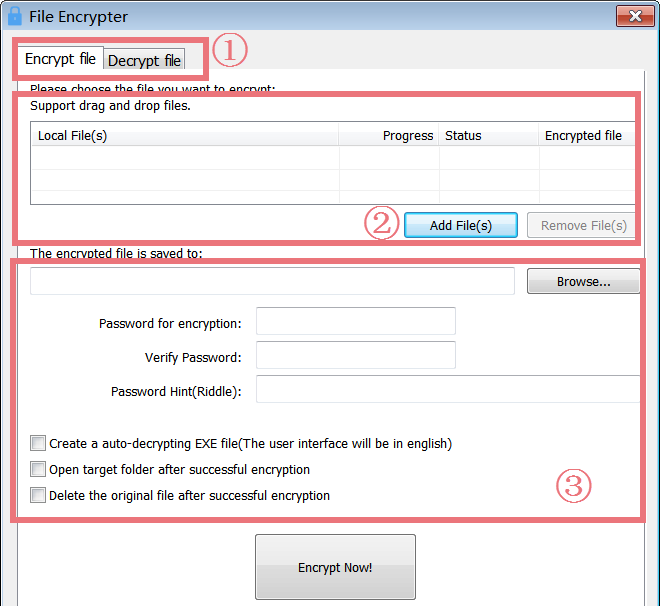 Decide if you would like to delete the original file or create a self decrypting EXE file. Click on the Encrypt Now! Button. If you created a self-decrypting Exe file, just launch the exe file and decrypt it. First select the file you want to decrypt by using the Browse... button. Then enter the same password that you used to encrypt it. Note: The password is case case-sensitive. Select the destination folder where you want to place the decrypted file by using the Browse... button. Click on the Decrypt Now! button. Click "Encrypt files" under Privacy, File Encrypter will pop up. Find and click File Encrypter icon, File Encrypter will appear. Please note: if you want to add File Encrypter in the Dock bar, click in Dock bar, remove any icon by dragging it out of the Dock firstly, and then drag File Encrypter in.